For the last lesson in this Geek School series, we’re going to show you how to use Styles, Style Sets, and Themes to save a lot of time when formatting your documents by creating reusable settings that can be applied to all of your documents. Up until now, you’ve been learning about how to create documents and implement formatting bit by bit. In other words, you create a document and changes you make are typically localized. In this lesson, we step back a bit and show you how styles can take the work out of creating a consistent look and feel that you can control from a central location rather than having to needlessly apply changes to each and every part. Styles are very useful for generating a table of contents but that is but only one use for them. 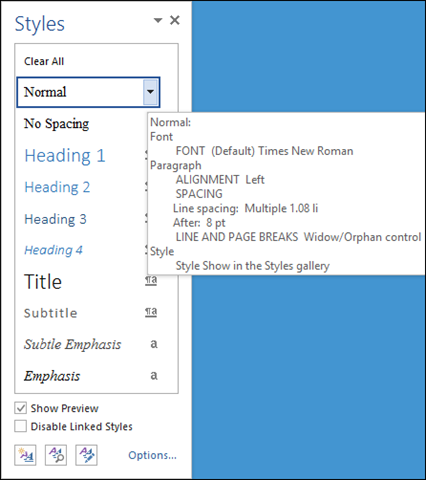 The main function for styles is to allow you to quickly set titles, subheadings, section headings apart from one another by giving them unique fonts, font characteristics, and sizes. 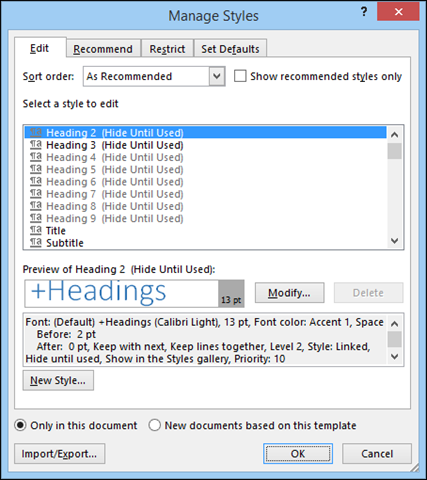 By grouping these characteristics into styles, you can create documents that have a consistent look without having to manually format each section header. Instead you set the style and you can control every heading set as that style from central location. 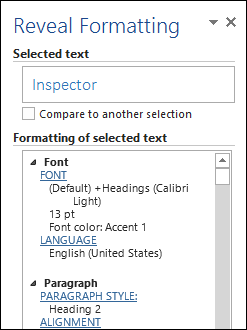 Apply a consistent look across the whole document instead of having to format each section individually. Apply same font to the entire text body. Apply the same font to header sections. Use a consistent paragraph spacing. Pick a default color scheme for SmartArt, charts, and shapes. Pick from a number of pre-designed styles use them as your own and modify them. Let’s go over some examples to give you a better idea of what some of these mean. First, note the “Styles” section on the “Home” tab. Click on the small arrow in the lower right corner for a floating “Styles” panel. This windows stays visible so you can use it as you work through your documents. You can move it outside the application window, and also dock it right or left side of it. 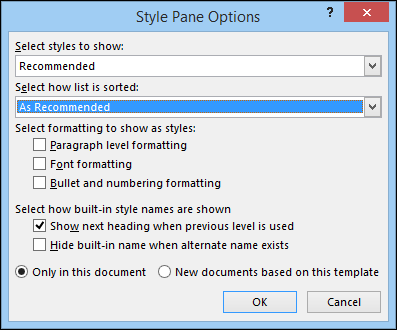 The style dialog box like format shape floats independent of Microsoft Word. That means you can move it outside the document to make more room or even more it to a second monitor if you are using dual monitors. Each style can be applied differently and you can hover over the symbol to the right to see exactly how it is applied. 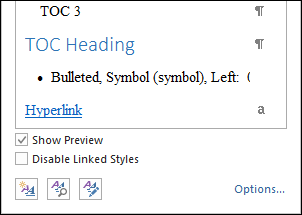 If you click on that symbol, you are presented with a dropdown options menu, which gives you further control over the styles in your current document. Along the bottom of the pane are three buttons, which have some pretty important functions. 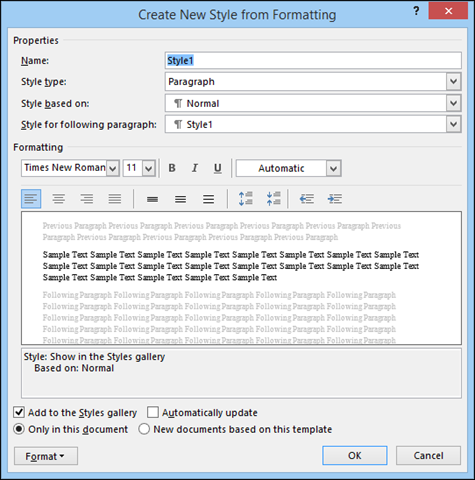 If you click “new style” the resulting dialog box will let you create a new style using existing formatting. As you apply new characteristics to the style, you can see how it will look in the preview. You can dig into the nitty-gritty specifics of the style including the format, such as if you want it to have bullets, borders, fonts, text effects, and so on. From there, you can add the style to just that document, or you can add it to the template so every document has that style from there on. 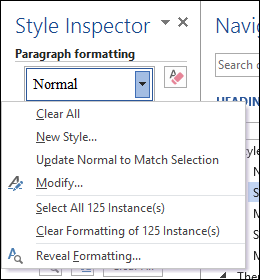 Use the style inspector to “inspect” styles throughout your document. This feature is useful for stripping formatting or further changing it. You can also click each style for a drop-down options menu, allowing you to modify and build a new style, select all instances of that style in the document or completely clear them. 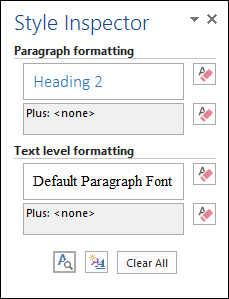 Click the bottom-left button to show the “reveal formatting” pane to see how your document is formatted. This is somewhat similar to or at least hearkens back to “Reveal Codes” in WordPerfect. 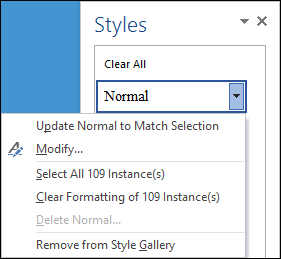 The “manage styles” button allows you to quickly edit styles such as to modify their appearance, reorder their recommended order of appearance, restrict which ones are available, and set new defaults to current styles. It’s useful to know how to take control of your styles because used well and wisely, they can give you a lot of power with your documents.